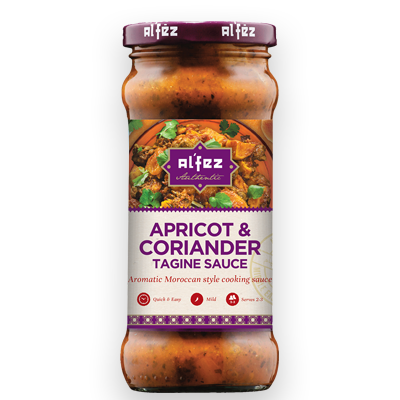 A rich, tomato-based sauce with an aromatic and herby sweet flavour that’s perfect with Chicken, Lamb or Vegetables. Ideal for creating a classic Moroccan Tagine stew. Use as a base for casseroles, as a cooking sauce, a pour-over sauce or as a dip straight from the jar. Tomatoes, Water, Olive Oil, Sugar, Apricots (Sulphites) (6%), Rice Flour, Coriander (1.5%), Garlic (1.2%), Salt, Mint, Paprika, Cayenne Pepper, Cinnamon, Cumin, Lemon Powder, Parsley, Caraway, Pepper, Acidity Regulator: Citric Acid.